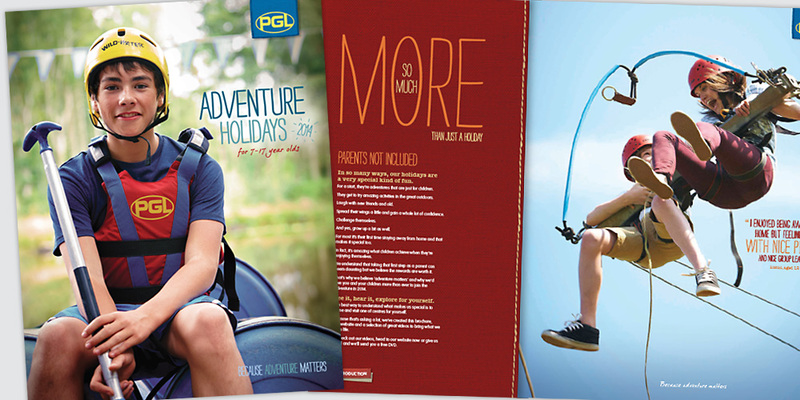 Our challenge with PGL Travel was to interrogate holiday product offerings and develop two brand identities: PGL Adventure Holidays, aimed at children holidaying independently, and PGL Family Adventures, aimed at families holidaying together. All communications were audited, reviewed, researched and developed. Logos, campaign lines and branding guidelines were set up as a primary determiner, creating a platform for continuing strategic consultancy. Brochure development for both brands is continually reviewed and the communication stays fresh and apparent to the relative target audiences, parents and children alike. Recently, we were asked to undertake a positioning review for the PGL Schools brand. Here we developed a new tone of voice and a more up-to-date look for a suite of brochures aimed at schools and teachers, which included us running a day-long workshop on emotive copywriting for the client’s in-house communications team. PGL has worked with Precision for over 7 seasons now. During that time, they have helped us to create and deliver a strong design platform for our products. We have a very strong working relationship and they are involved in all aspects of our creative work, both online and offline. In Precision Creative and Media we have found a partner to whom we can safely entrust the development of our brand.